Ayaz Qala consists of three fortresses built from the 4th century BC to the 7th century AD. 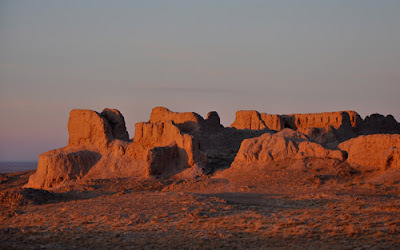 They formed part of a network of fortresses on the edge of the Kyzul Kum desert and are now on the World Monuments Fund's list of the 100 most endangered sites. 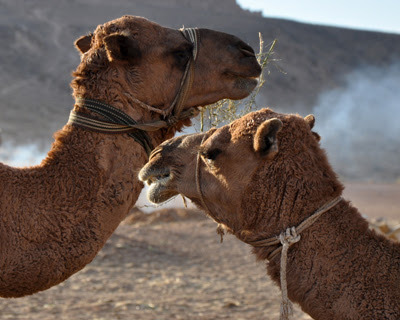 A night at the Ayaz Qala yurt camp is one of the highlights of an Uzbek Journeys tour. The steppe, the silence and the stars are remarkable. Another highlight there is meeting Rano Yakubova, the impressive, funny and energetic woman who manages the camp. 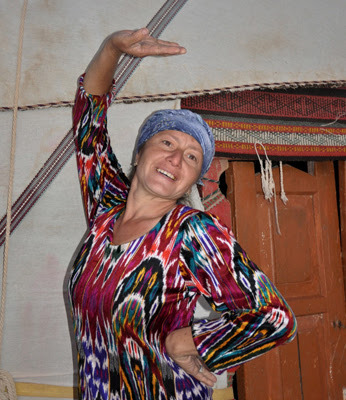 Her sister, Dilbar, started the yurt camp in 1998; Rano has been running it since 2006. In Soviet times Rano studied Uzbek literature at university and was a high school teacher. Now she lives in this beautiful, though rather remote camp, 9 months of the year. And she does so with flair, good humour and a good kitchen. The yurts are comfortable, sleeping 6 persons. There are wash basins and two flushing toilets at the camp. During conservation work on the fortresses in 2005, UNESCO was impressed with the yurt operation and kicked in funding for solar energy panels and a water filtering system. Rano lives on site from March through November, managing her team of 6 -15 staff, depending on the season. Most are family members and neighbours from her village. Her husband is the handy man. Staff bathe at a hammam (traditional bath house) 8 kms away. Supplies are sourced from the nearest bazaar 25 kms away. Rano has trained all the kitchen staff; the meals served are tasty and nourishing. Evenings at Ayaz Qala are special: watch the sun set from a tapchan (a raised platform used for relaxing and reclining in Uzbekistan), then watch the stars decorate the black sky. Rano arranges a concert after dinner - outside if possible, or inside the very big yurt if it is too cold or windy - with musicians and a traditional dancer from the village. It is a simple and authentic performance. By now, Rano's major responsibilities are over for the day and she lets loose, making sure everyone has vodka or beer and insisting everyone dances. This is when she enjoys herself most, sitting and dancing with her guests, telling stories or reciting poems. Next morning, after a spectacular sunrise and a simple breakfast, Rano will see you off, begging you to come again, to stay longer, to keep her company and to dance again on the steppe. Returning to Rano's warm welcome at Ayaz Qala is one of my great pleasures. I am sure you will like her very much indeed.